(TibetanReview.net, Oct09, 2014) – China has launched on Sep 20 a new month-long “rectification and cleansing” campaign against Tibetan Buddhist monasteries in Driru (Chinese: Biru) County of Nagchu (Naqu) Prefecture, Tibet Autonomous Region, reported Radio Free Asia (Washington) Oct 7. Under it, all new religious structures built or put up after 2010 have to be pulled down within specified time. Also, all monk-students considered underage by the Chinese government should be returned home. The instructions detailing the new campaign are said to be outlined in a 30-page booklet being distributed to all the monasteries and in villages door-to-door by government workers. All new stupas, mounds of mani stones [piles of stones each carved with religious mantras], and religious shrines built after 2010 have been declared illegal and must be destroyed by a specified deadline. So also retreat facilities built after Nov 1, 2011, including hutments built for individual retreat practitioners. Monk-students aged 12 and below must return home to their villages by Oct 20 or should be expelled. Families that fail to take their children back face a six-month detention and even imprisonment for up to three years. Besides, lamas or khenpos (abbots) who hold back any such underage monk will be punished and also expelled. 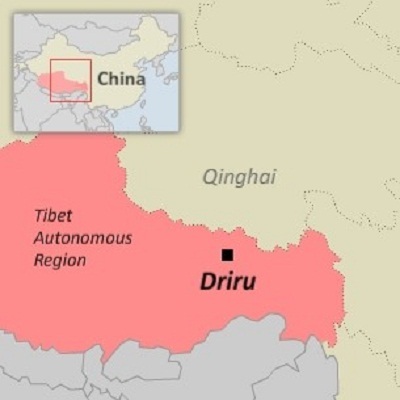 Driru came under a series of repressive Chinese government campaigns after the authorities launched a campaign in Sep 2013 to require all Tibetan homes and religious centres to fly the Chinese national flag from their rooftops. Tibetans not only refused but staged large-scale protests against it, leading to killings, large scale detentions and imprisonments, closing down of monasteries and so on in Chinese reprisal actions. Currently, monks and nuns who fail to fly the Chinese flag from their houses or to prominently display the government issued portraits of top Chinese leaders face expulsion from their monastic community. Besides, they are forbidden to keep any picture of their exiled spiritual leader, the Dalai Lama. Those found in violation of this rule are ‘re-educated’ and also deprived of the state benefits recently made available for monks and nuns as a condition for remaining patriotic.